Numerics for iOS 8 is here! Now track numbers on your today screen, secure your dashboards with Touch ID and more. 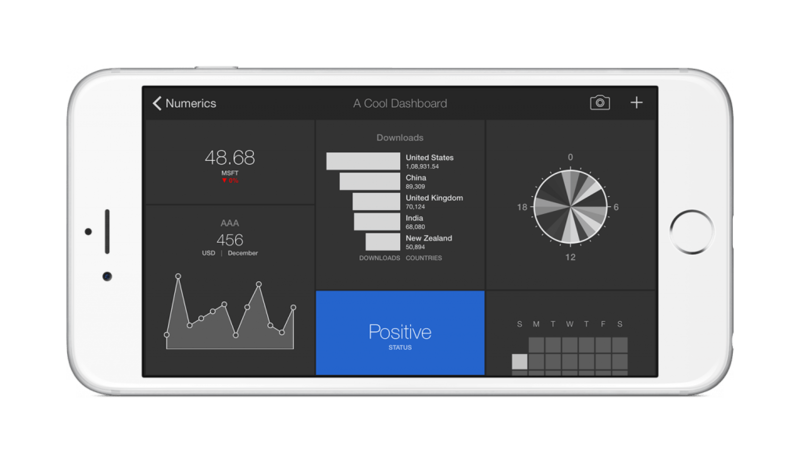 We created Numerics to help businesses visualize all their important numbers in one place and make better decisions. We are constantly working to improve the way our users consume and interact with their business metrics. With iOS 8, Apple provided some great new APIs and interesting ways to extend apps that we have been hard at work to incorporate into Numerics. When Apple announced the ability to add Today Widgets in the Notification Center in iOS 8, we were thrilled about what it could mean for Numerics. Version 2.0 introduces the Numerics Today Widget enabling users to selectively add any of their Numerics dashboard widgets to their today screens. Based on the type of widget e.g. number tallies, graphs or top lists, Numerics intelligently picks up the most relevant value (instead of replicating the whole widget) and displays it on your iPhone or iPad’s Today view. This means that users can now get a quick glance at their most important business metrics by simply swiping down the Notification Center from the top of their screens. We believe that Numerics provides one of the most apt and useful widgets for the iOS Today view out there on the App Store. Just swipe down the Notification Center to know how many sales you have made today, how many subscribers you gained or any other number that you like to keep your eye on all the time. The Touch ID now a standard feature of iPhones & iPads, is a marvel of security for business users. And with iOS 8, we can finally use Touch ID to do more than just unlock our iPhones and purchase things from the App Store. With v2.0, Numerics now optionally locks itself out when the user switches out of the app. Users can use Touch ID to unlock Numerics when it is locked out. For older devices without Touch ID, Numerics uses the device passcode to lock / unlock the app so you dont have to set and remember another passcode for Numerics. Numerics 2.0 also introduces a fully functional landscape view on iPhones, for all users who like to view Numerics with their iPhones docked in landscape mode on their desks. The announcement of the new iPhones has further added to our excitement. We think the iPhone 6 Plus is a new category of device and deserves special treatment. We have designed a unique landscape experience for the iPhone 6 Plus: The main dashboard in the landscape view provides a compact and crisp layout that displays 3 columns of widgets making use of the huge screen and presenting the user with a lot of information at a glance. The edit views and inner interfaces resemble the iPad experience when on landscape in the 6 Plus. The new adaptive APIs of iOS 8 has allowed us to create a truly universal app with custom tailored experiences for each device form factor. We have been getting an enormous number of integration requests from you users and are constantly working to add new data sources. Numerics now integrates with 2 of the most requested for services - MailChimp and Instagram, adding 47 new widgets that are great for marketers to track their campaigns on these 2 services. We have revamped things under the hood with major enhancements to the Numerics framework including widget definition caching that reduces load times (after first run) exponentially and squashed a number of annoying bugs. To users Numerics should now feel much more robust and reliable than before. We are very excited with what we have accomplished in Numerics 2.0 and we’d love to hear what you think of our new update.